Banana cream pie is a real favorite around here. The combination of sweet bananas, a pastry crust and custard just can’t be beat. Top it off with slightly sweetened whipped cream or meringue if you prefer and you have a wonderful dessert your crowd will love. Combine sugar, cornstarch, and salt in a saucepan. Add milk gradually. Cook, stiring constantly, over medium heat til bubbly. Cook and stir an additional 2 minutes and remove from burner. Stir small amount of hot mixture into egg yolks, immediately add egg yolk mixture to hot mixture and cook for 2 minutes, stiring constantly. Remove from heat. Add butter and vanilla and stir til smooth. Slice 3-4 bananas into the cooled baked pastry shell. Top with pudding mixture and spread meringue or fresh whipped cream (if desired) on top of the pie. Cool. This pie is great topped with either meringue or fresh whipped cream. I prefer the whipped cream but if you like meringue, it is a great way to use up the egg whites left over from the yolks in the recipe. Whip the egg whites until they form stiff peaks. Spoon over the completed pie, then bake at 350º degrees for 12-15 minutes. I can pretty much guarantee that any time you make this banana cream pie recipe it will be a hit. It’s a Sunday dinner favorite, great for pots luck dinners, barbecues or picnics too. 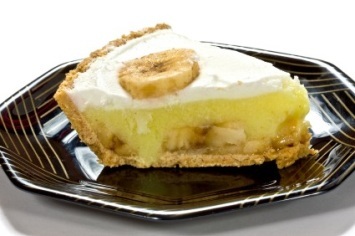 This delicious banana cream pie recipe is just one of our wonderful pie recipes. Find them all here. I made this pie twice and it didn’t turn out, I followed the receipe to a tee. It was watery, what am I doing wrong? I really want a piece of banana cream pie already!! I have no idea what could have gone wrong, unless you didn’t cook the pudding long enough for it to become thick. It sounds like the pudding may have separated for some reason. That would account for the watery texture.